Cruise holidays are fantastic for families of all sizes and ages, meaning that kids, mums and dads, grandparents, aunties and uncles and cousins can all holiday together, finding activities to suit their own tastes. Here we look at some of the best cruise ships for the whole family. The upcoming liner from the Royal Caribbean takes to the water next spring and already has a number of exciting itineraries planned for passengers as well as a whole range of activities for all ages. For the youngest charges aged 6-36 months, Royal Caribbean offers the Royal Babies & Tots nursery where babies and toddlers are kept entertained by trained professionals. Operating throughout the day and evening, parents can drop off their babies when they fancy some alone time. The SeaPlex is to be the largest indoor activity space at sea, offering basketball courts, circus school, bumper cars and roller skating for kids of all ages. The comprehensive activity centre is complete with food trucks and a DJ spinning fresh tunes overhead. Sometimes the most difficult demographic to satisfy, teenagers will find plenty to do aboard the Anthem of the Seas with a range of action sports available including rock wall climbing and surfing on the FlowRider wave simulator. The Two70 venue is the incredible, adaptable performance and relaxation area that hosts a number of stunning shows at night. During the day the space offers 270 degree views of the seas and an ice-bar with highly-trained mixologists on hand to create your favourite cocktail. Take a trip back to a bygone era in The Grande Restaurant, offering beautiful dining in a luxurious, formal setting. The varied menu and selection of wines are sure to satisfy even the most advanced of palates and offer a relaxing break from the kids and grandkids. At just over two years old, the MSC Divina is one of the jewels in the Mediterranean Shipping Company’s Crown. Specialising in cruises around Florida and the Caribbean, the MSC Divina is a fantastic option for a family holiday. The ‘Kids Under 11 Sail Free’ option certainly makes the Divina a more affordable option for all the family to sail. MSC Baby Time is a fantastic activity club for those aged 10 months to 3 years with a comprehensive range of toys to play with in a supervised area. The MSC Divina plays host to The Smurfs Club, a fun-filled area for the kids to play with other children of their age. The play area comprises of a dry section and a water park for the kids to explore and enjoy. Teenagers can enjoy a bit of freedom and time away from the parents in the Graffiti Teen Disco. The Graffiti Teen Disco is adorned with fun and creative graffiti art and teens can enjoy games such as Foosball and the video games of the adjoining arcade. The pirate-themed acrobatic and contortionist show continues to excite and intrigue passengers. For the sports fans on board, the American-themed sports bar shows all the latest action from the world’s most popular games. The Top Sail Lounge is an exclusive setting for Yacht Club passengers to enjoy the unparalleled views, drinks and the playing of the pianist. This is the perfect retreat after a day of looking after the grandchildren. P&O Cruises are a charmingly British company dedicated to providing the highest levels of service. 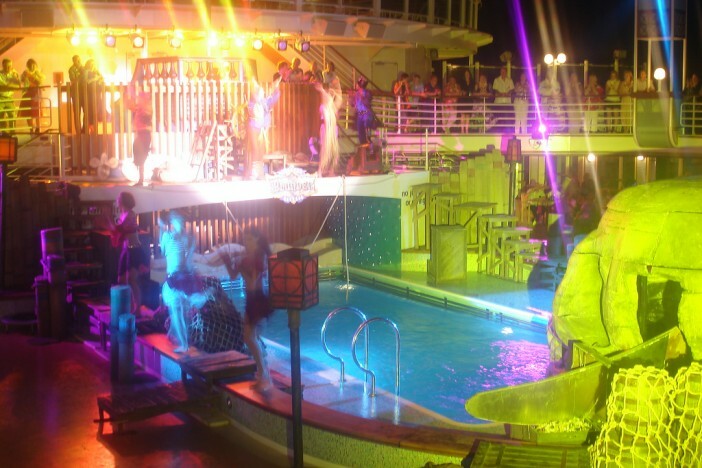 The Ventura is the largest ship in their fleet and dedicated to ensuring that everyone has a fantastic holiday. The Ventura’s cruises concentrate heavily on excursions, meaning that there are a lot of opportunities to plan private trips. These can be used to indulge the baby of the family and tailor your trips to their needs. Little Miss Sunshine, Mr Bump and Noddy are just a few of the children’s favourites that are regulars aboard the P&O Ventura keeping children happy and engaged. The P&O Ventura has concentrated heavily on keeping teenagers entertained, providing a selection of great sporting activities. The active teens can choose from a large sports court, four pools and a fantastically-equipped gym. The Ventura plays host to an awe-inspiring two-deck theatre that regularly puts on stunning cabaret shows, tribute acts as well as comedy and dancing shows. The Metropolis bar is a unique setting which offers a backdrop changing daily to represent a different cityscape. P&O made a major coup when they acquired the services of one of the world’s best-renowned chefs: Marco Pierre White. The celebrity chef’s signature restaurant The White Room is hugely popular with guests and is joined by 11 other eateries on board.